Visualize with Audio, check those lessons! A teacher cannot expect that students are able to master the material by only reading books and answering worksheet questions. Students need visuals along with enthusiastic instruction by the teacher. A smart board is an excellent tool to customize and display information visually. Teachers can use graphics, videos and audio to enhance the quality of classroom instructions they are receiving. Overall, using visuals can help teachers to engage students and communicate important lessons effectively. Images and videos are widely used in education, but learning with the use of audio is used to a lesser extent, even though there are various possibilities to incorporate audio in your lesson plans. Audio could be used to manage your classroom without speaking loud. You could arrange a sound for silence, the start and end of an activity or for special occasions. But also for language and math sound is an effective tool. The simplest way is to use sound as a control variable. For instance in your language class, if a word is spelled correctly the students hear one sound, if it is spelled incorrectly another sound. Interactive whiteboard software often includes a feature of some sort to include sounds in your lesson. Gynzy has many examples of interactive smart board activities that teachers can use to generate student interest and alleviate classroom boredom with use of sound. Activities like ‘Comparing’, ‘Correct order’, ‘Counting how many’ and ‘Counting by order’, all work in the same mannerway. A written question will appear which will be read out loud. Underneath the question the students will see four images. The students have to press the correct image when the interactive whiteboard asks the question. When the student is right, a happy face will appear. If the answer is wrong, you’ll see a less happy face and the student can try again. In many (math) activities you need to use random numbers. 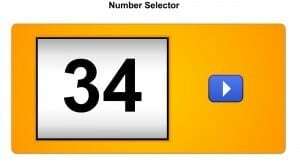 The Number Selector is a tool that you can use to generate a random number between 1 and 100 (or any other range within the 1-100 range). This tool also provides sound by speaking the number out loud. This really helps your students to internalize the numbers and their pronunciation. Teach students how to rhyme by using of the ‘Rhyme with images’ activity. In the activity, three images appear on your interactive whiteboard. Two out of the three images are words that rhyme. Students move two images into the empty boxes. When you click on an image the object’s name will be played back. Practice the Vowel Consonant E Rule with the ‘Silent E’ activity‘. An item is displayed on your smart board. Drag the item under the magic magnifying glass. It will automatically add the vowel “e” at the end of the word, changing the item into a completely different item. For example, the word “pan” becomes “pane”. Both words will be pronounced by the interactive whiteboard, so that the students can hear the difference. This feature also allows your students to practice the Vowel consonant E rule individually. Do you have more examples in which sound is a great tool to teach students? Share them with us in the comments or on our Facebook page www.facebook.com/GynzyUS.